I have been collecting basketball cards on and ff since the mid-1990s. I first chanced across some cards when on a holiday to the USA (I live in the United Kingdom) and have been intrigued by them ever since. Having taken a three year hiatus away from the hobby, I have recently started to pay attention to it and decided to start collecting some cards again. At the same time, I thought that I would also start a small blog that is designed to cover my musings on the basketball card industry, whilst also showing some my collection as it starts to build again. Before I can really get started, I need to first sort through my collection and make some decisions on the direction I want to take it. It is fair to say that it is a little bit 'random'. 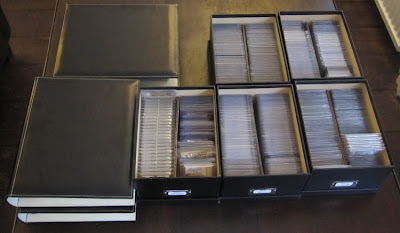 There a number of incomplete sets ranging from the mid-1990s through to 2009, as well as the start of a couple of player specific collections. It needs sorting out. Apart from deciding that I want to focus on quality rather than quantity - I live in a pretty small apartment and space is at a premium - I have still not worked out exactly the direction I plan to take my collection. So over the course of the next week or so, I will be sorting through above lot and deciding on what is staying, what is going and where next?